Brooke-Popham ("Brookham" to friends) graduated from Sandhurst in 1898, fought in the Boer War, and became one of the first British military aviators in 1911. He saw no combat in the First World War, serving instead as an air staff officer. He key figure in the creation of the Royal Air Force served in technical staff positions, as air defense commander of Britain, and as air officer commanding in Iraq and later for the entire Middle East. He retired and became governor general of Kenya in 1937. Called out of retirement when the European war broke out, Brooke-Popham was appointed commander in chief in the Far East in October 1940. At the bottom of everyone's priority list, he received little in the way of modern equipment or well-trained troops and was unable to prepare an adequate defense of Malaya against the Japanese invasion which came in December 1941. Though elderly and prone to falling asleep during meetings, he was hard and methodical in the field. He got on poorly with Duff Cooper, who was sent to Singapore with Cabinet status, which could not have helped Brooke-Popham's cause in London. I had a good close-up, across the barbed wire, of various sub-human specimens dressed in dirty grey uniform, which I was informed were Japanese soldiers. 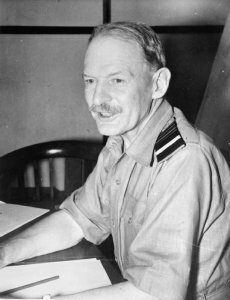 Brooke-Popham allegedly told British officers at Hong Kong that the Japanese were incapable of night flying. Brooke-Popham sought repeatedly for permission to implement MATADOR, a preemptive move into a potentially strong defensive position in southern Thailand, but was refused for political reasons. He was relieved on 27 December 1941 and thereafter played no significant role in the war, retiring in 1945. Graduates from Military Academy. Joins Oxfordshire Light Infantry. Retires. Appointed governor of Kenya.